Baking chiffon cake in a non-stick rice cooker pot is really a big challenge, this is my 4th attempt in 3 months' time using the same recipe and I am quite near to success, but not 100% yet. I have never attempted a cake so many times, usually if it fails, I would just chuck the recipe, consider it a gone case and move on. But because this recipe is an oven recipe which I have tried many times before, and I know it works very well in the oven, so when it did not work in the rice cooker, I knew it has nothing to do with the recipe but it may have either something to do with my rice cooker pot's non-stick surface, or something to do with the way I handled the cake out of the cooker pot. If you look at my 1ST ATTEMPT, I used 5 eggs and it hit the ceiling and collapsed terribly. So I had to adjust to 4 eggs. This was my 3RD ATTEMPT using 4 eggs. The quantity of the batter was adjusted to 80% for a 5.5 cup cooker, but I greased the sides of the pot, and I was busy taking fotos after I opened the lid of the rice cooker. Also I peeped twice when the cake was cooking. And when I opened, I did not immediately invert the cake. So many factors contributed to its downfall. Hence the cake shrunk a little, but the texture was still good. Now this is my 4th attempt, I thought it was near to success, until a baker friend June corrected me and told me my method of unmoulding the cake was not correct. What i did was I knocked the pot hard on the table a few times (with kitchen towel underneath to cushion it) to prevent shrinking, used a knife to loosen the edges before I inverted the cake. This was not right. I would explain later what should be the correct method below, which I will try again in my 5th attempt. Now, why did I go to all the trouble to do this, when I could have done the chiffon cake in an oven? Well, not everybody has an oven, so I just wanna show that chiffon cakes can be done in the rice cooker with the correct recipe and correct method. 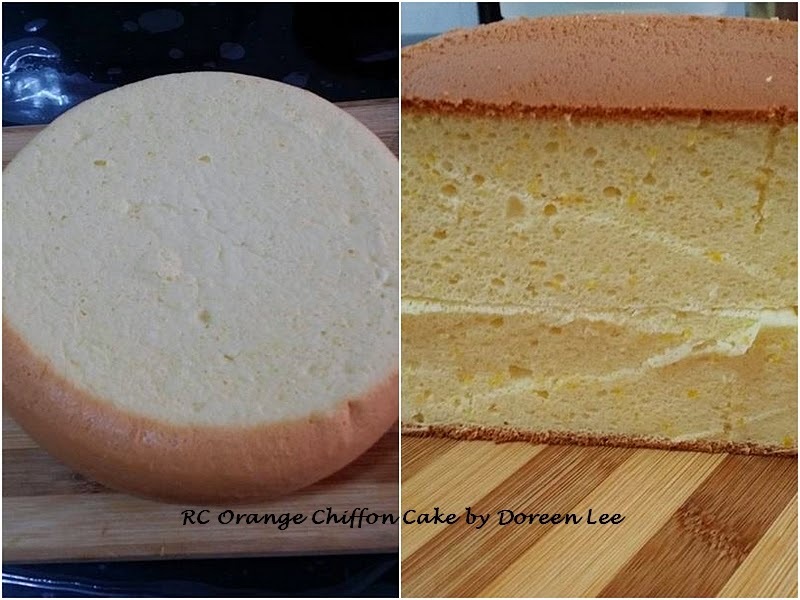 The best way of doing chiffon cakes in the rice cooker is of course to use a disposable paper chiffon mould which you can get from Daiso or Phoon Huat. A picture of the paper mould is shown on my FB album HERE. But I do not have such paper moulds with me in Belgium. This has so far yielded the best results as proven by the inventor of this method, Charmaine of Mimi Bakery House who has baked a cocoa chiffon cake in paper mould HERE, and Rene A Ling who has baked 4 different chiffons using a paper mould as shown HERE. 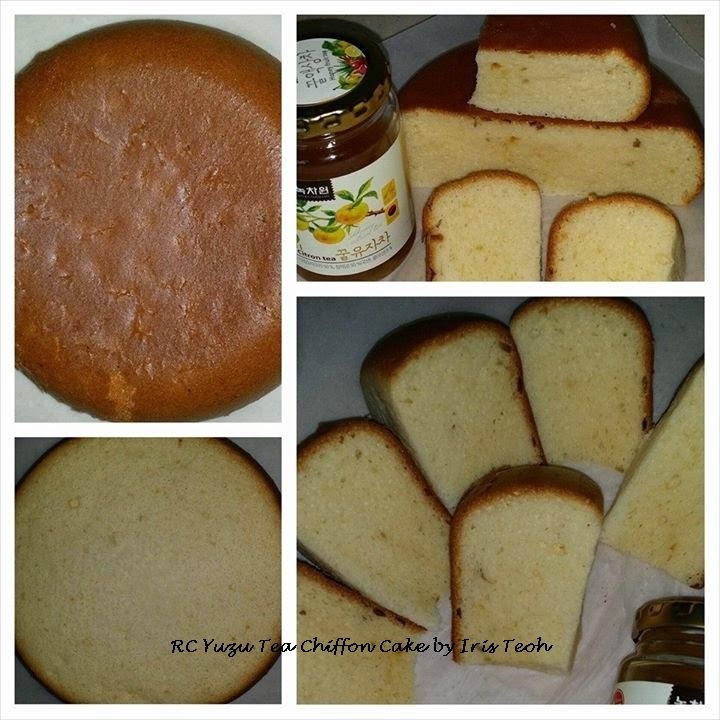 Orange Chiffon Cake using direct method in Toshiba 5.5 cups fuzzy logic non-stick rice cooker. 1. Sieve flour and baking powder together in a big bowl. 2. In another big bowl, use electric whisk to whisk egg yolks with 24g sugar and salt till light and creamy, about 1 to 2 min. Add in corn oil followed by oange juice and rum or vanilla essence and mix well. 3. Add in the flour mixture from step (1) into the egg yolk mixture from step (2) and fold in swiftly and lightly using a spatula. 5. Pour 1/2 of the egg white mixture from step (4) into the egg yolk mixture from step (3), and use a spatula to fold in swiftly and lightly. 6. Pour the combined mixture from step (5) into the rest of the egg white mixture and again use a spatula to fold in swiftly and lightly. 7. Pour the batter into a rice cooker pot, grease the bottom lightly but DO NOT grease the sides!!! Preheat the cooker by pressing cook function 5 min in advance. Cancel the cook function and repress cook again. Cook for about 40 min (for 5.5 cup Toshiba cooker without baking function). If you have baking function, you can use baking function. Note that baking time varies due to different brands and technologies, pls use your own judgement. 8. Now for the last step of removal - I have actually made a few mistakes, and only upon discussing with a fellow fb baker friend June, that I realise my mistakes. So I will only tell you what you should do, so that you will not repeat the same mistakes as me. When the cake is ready, open the lid of the cooker, and take out the pot. Do not take any pictures or waste any time once you open the lid. Slightly knock the pot on the table once or twice so that the air bubbles in the cake will be "shocked", and will not shrink. If you omit this step, your cake will shrink badly. Then immediately invert the pot. Do not use a knife to dislodge the cake before you invert. Invert it and wait for it to cool down. Once the cake has cooled down, then you can use a spatula to carefully nudge and loosen the sides of the cake from the pot. It should fall off easily. - I stopped at 17 + 18 = 35 min because my rice cooker was already preheated for too long (15 min) while I was preparing the cake, I should have baked 5 min longer, at 40 min. This is the first time I preheat the rice cooker pot for my cake. If you do not preheat the rice cooker, you should bake for 50 min. You can see a ring that "eats" into the sides of the cake, that probably indicated that the cake was too moist and needs to be cooked a little longer. - After pouring in the batter and before putting the pot in the rice cooker, bang the pot on the table a few times (cushioned with kitchen towel) to release big air bubbles and if neccessary, use a chopsticks to run through the batter in a figure of 8 to break all air bubbles. - Note that this recipe is for a 5.5 cups RC, which is 4 eggs version. If you have a 8 cup RC, you can use 5 eggs, if you have 10 cup RC, 6 eggs would be better. Use calculator to calculate, take the basic 5 eggs oven recipe divide by 5, then multiply by N to get N eggs, and you must apply for all the ingredients proportionately. - The logic behind knocking the chiffon cake on the table to prevent shrinkage is based on this article by MoreThanBread, shared by my friend June. Read it, it is very enlightening! If you have never heard of rice cooker baking, do read up the FAQ first and check out my rice cooker cake index, I hope you will enjoy the fun of baking in your rice cooker! 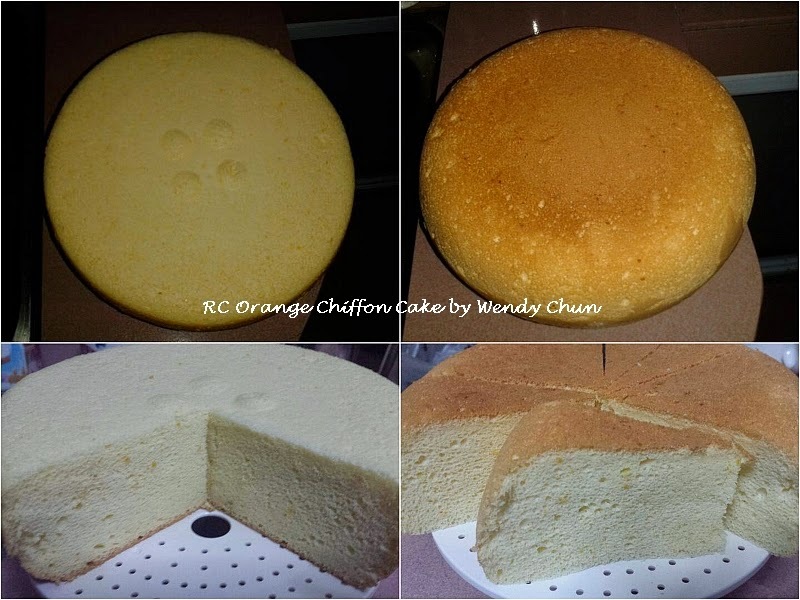 Here are some cake fotos from my baking friends who tested this orange chiffon cakes in their rice cookers right after I posted this recipe. 30 June 2014 - Wendy's RC Orange Chiffon made in her Toshiba 10-cup fuzzy logic RC with baking function. 4 July 2014 - Iris's RC Yuzu Tea Chiffon Cake made in her Toshiba 5.5 cup fuzzy logic RC without baking function, same model as mine. She pressed cook 3x and took 50 min in total. 5 July 2014 - Doreen's RC Orange Chiffon Cake made in her Panasonic 10-cup fuzzy logic RC. Hi Hi, I have been looking for receipe for steamed chiffon cakes. May I know if this receipe can be done by steaming in a wok. Sorry for the late reply as I didn't see your email until now. Not sure if it can be done in a wok, I haven't done it before. The end result in a 5.5 cup Toshiba was so tall that it nearly hit the lid of the rice cooker.